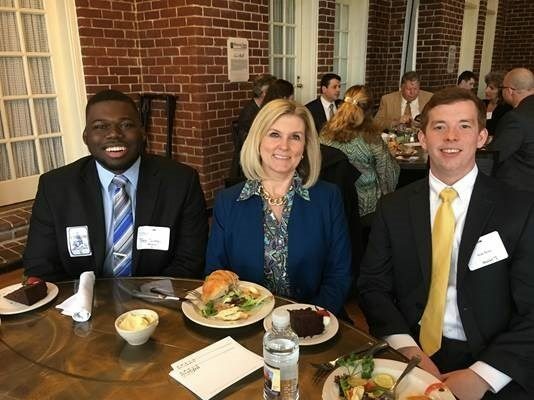 Baltimore native Theo Sutton, a tax intern at KPMG’s Baltimore office, got more than he hoped for out of his experience at the MACPA’s annual CPA Day on January 26 at the state capitol in Annapolis, MD. After sitting in on the initial prep sessions offered by MACPA leadership to the 100+ attendees at the CPA day program, Sutton and his fellow attendees received their program itineraries to fan out and meet with their respective members of the Maryland General Assembly and State Senate. Arriving at Sen. Shirley Nathan-Pulliam’s office, Sutton was greeted by staffers who listened attentively to the issues that he presented, including MACPA’s support of Comptroller Peter Franchot’s Taxpayer Protection Act. Noting Sutton’s maturity and earnestness, the Senator’s staff explained that she was attending a meeting of the Legislative Black Caucus of Maryland and asked if he would like to observe the meeting. Sutton was excited and grateful for the opportunity to sit in on the Legislative Black Caucus meeting. Although the meeting was wrapping up, the Members were very cordial welcoming him and asked him to share a little bit about himself. Noting names of delegates and state senators in the Black Caucus meeting that had grown familiar to him, including Benjamin Brooks, Jay Jalisi, Adrienne Jones and Shirley Nathan-Pulliam, “When you hear all those names all the time growing up, about people who are so passionate about what they do for the community,” it really meant something to him to be in that room. Sutton shared that the members of the Black Caucus were focused on the most prevalent issues in communities today: how do we work together to reach a common goal where there is betterment of everyone in the community, not just for African Americans, but if we can make a difference for everyone. Why was participating in MACPA programming, and CPA Day in particular, of interest to Sutton? He explained, “My campus recruiter had invited me to CPA Day so I could get a better understanding of what the CPA is, that there are people out there to assist you on your journey. Christine Aspell, Managing Partner, KPMG Baltimore, encouraged Sutton and other interns to attend along with experienced tax and audit pros. During the lunch session with legislators, Sutton sat with some MACPA members from District 9, and much of the discussion turned to the MACPA’s support of the Taxpayer Protection Act, Senate Bill 304. (See: MACPA to Testify in Support of Taxpayer Protection Act). The experience of CPA Day left a strong impression on Sutton. “One thing that really caught my eye was just how busy – yet organized – everything is: everyone is flying from place to place a million miles an hour, there’s a lot of meetings, discussions.” He also saw certain parallels between how CPA Day was conducted and the proceedings of the Black Caucus meeting he observed briefly. How did Sutton decide on KPMG for his internship? Sutton says he is looking forward to many more CPA Days in the future, and other benefits of being a MACPA Student member. “I am a long way from graduating at this point, but it’s nice to have a clear goal in mind and a group to help me get there.” Check out MACPA’s Student Leadership Academy.